There’s no such thing as a cat stuck up in a tree. If he could get up there, he can get down. Never saw a cat skeleton in a tree, ever! So today, the phone rang while I was at my desk (indoors, my least favorite work environment). The caller said he had an unusual question and didn’t know who else to call. 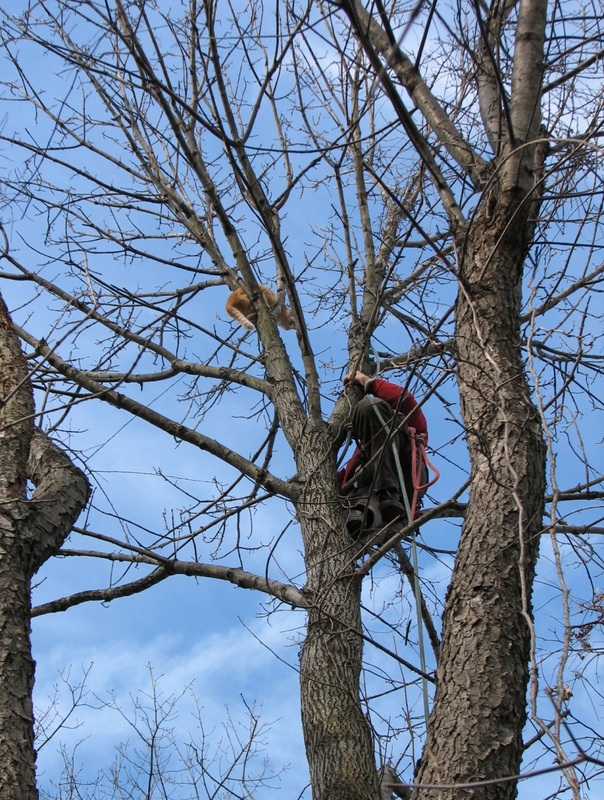 His cat had been in the top of a tree in his backyard for over two days. He sounded like he was slightly embarrassed to ask me to come out and rescue it. He also sounded worried. I told him I’d call him right back, after I contacted my crew. I called the crew’s two cell phones and got no answer (our job sites can be loud). While waiting for their return call, I pondered this job request. Should we do it? The cat will probably come down itself eventually. Will my climber be reluctant to risk getting scratched and bitten over a cat? Then I decided “yes – of course we’re going to do this – we can use the blanket method of wrapping the cat, like when we need to take ours to the vet, to avoid being injured if the cat’s response is ungrateful. And besides, this guy’s concern is genuine – he didn’t even ask what I’d charge, he just wanted his cat safe. So I called the man back and told him we’d be there within an hour. I drove to the nearby property where my men were working and enlisted my foreman, Ricky. We took the tree truck (which contains every piece of equipment we could possibly need) and together we went to Eagleville to meet the anxious cat owner. He was waiting outside when we got there and pointed immediately to the top of the tallest ash tree at the rear of his property. The cat’s name is Budweiser. A big orange tom cat. It was petrified. Its free paw was actually shaking as it looked down at us. Ricky proceeded to set his climbing line in the tree, using the throwball. This scared the cat even more, causing it to pee. A lot. Thankful that the cat’s bladder was now probably empty, Ricky ascended the tree. “Bud” is bundled for the trip down. 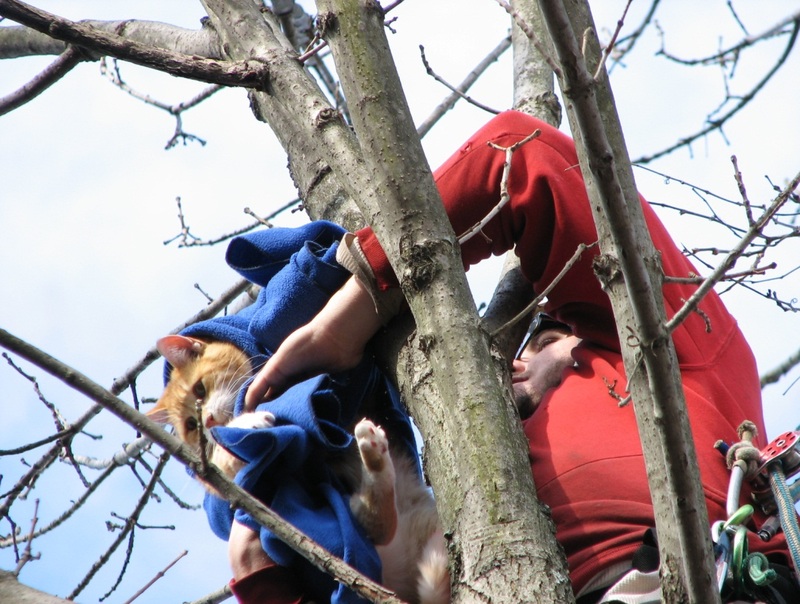 Ricky wouldn’t have needed the blanket – the cat seemed very agreeable to receive company up there. The descent was uneventful. So back to the beginning of this story. The myth that it is impossible for a cat to get into a situation where it can’t come down is just that – a myth. In most cases they eventually will get out of the predicament on their own, especially if left alone without too much fuss and attention. But if several days go by and they are still up there with no food and especially with no shelter in bad weather, they probably actually do need intervention. 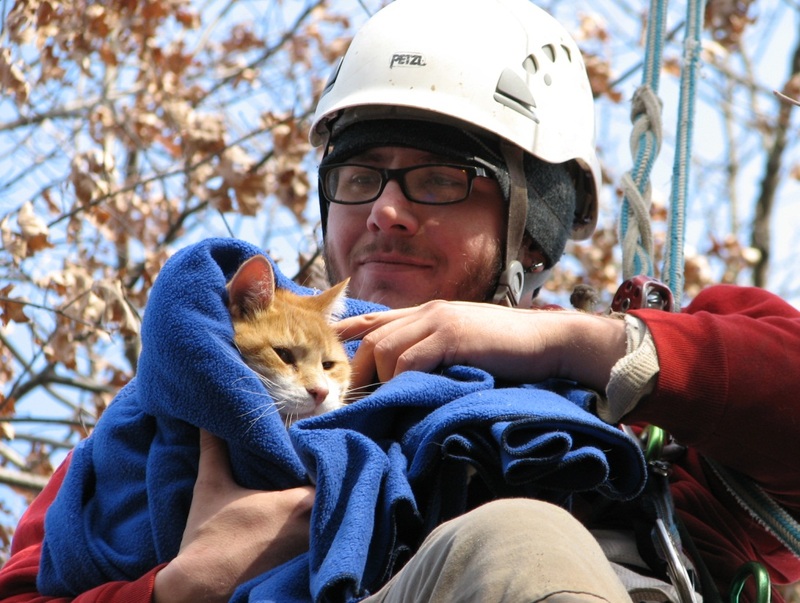 I learned a lot about this topic and you can too, from Dan Kraus’s website: catinatreerescue.com. Dan is a world-class professional climber and a really good guy, and his website contains a directory of climbers throughout this country and internationally (!) who are willing to take on this type of emergency rescue job. It’s been a while since I’ve showed tree news through this column, but that doesn’t mean there hasn’t been any. The last months of 2009 were actually very eventful in the local arborworld, I’ve just been a little too preoccupied to report on it. But I promise to get back on here really soon with a recap. Check back next week if you’re curious. 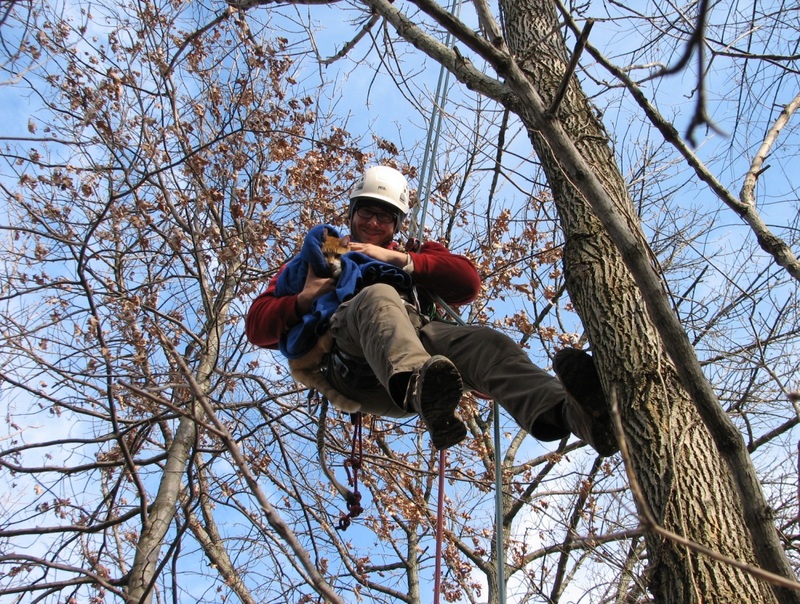 ← Does your oak tree look bad?